Enjoy a day on the lake in sunny Orlando! 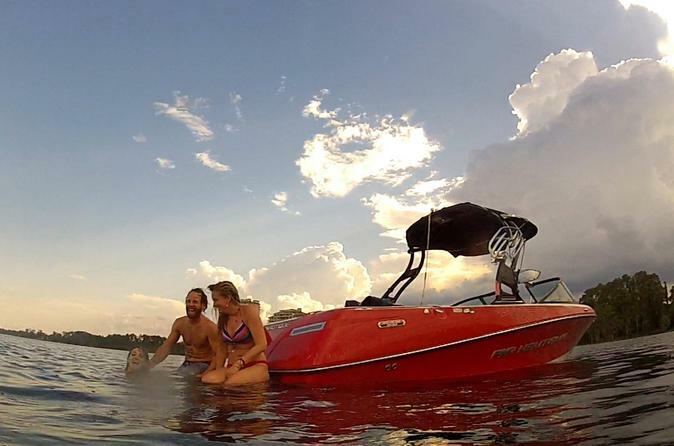 Learn how to waterski or wakeboard or if you prefer - tubing! This charter includes the instructor as well as all the necessary equipment and gas. The price displayed is per boat, so you can have a group of up to 8 people to all experience the thrill of watersports! Lake Bryan is a beautiful and natural spring fed lake in the Lake Buena Vista area of Orlando. Enjoy boating on the fresh water and once here, you will also have access to the white, sandy beach. Here, you can try your hand at either wakeboarding, waterskiing or tubing for either a 30-minute or 1-hour charter. The rental includes all the necessary equipment such as life jackets, boat captain, wakeboard, waterskiis, tubes and gas. Knee boards are also available upon request. Swimming experience is not required although if you are unable to swim, you must wear a life vest at all times. Minors must have a parent or guardian present at check in.